The National Research Council (NRC, French: Conseil national de recherches Canada) is the primary national research and technology organization (RTO) of the Government of Canada, in science and technology research and development. The Minister of Innovation, Science, and Economic Development is responsible for the National Research Council. The transformation of the NRC into an RTO that focuses on "business-led research" was part of the federal government's Economic Action Plan. On 7 May 2013, the NRC launched its new "business approach" in which it offered four business lines: strategic research and development, technical services, management of science and technology infrastructure and NRC-Industrial Research Assistance Program (IRAP). With these services, NRC intended to shorten the gap between early stage research and development and commercialization. At one point, NRC had over 30 approved programs. The tenure of John McDougall as President of the NRC (2010–2016) was marked by a number of controversies. His presidency was characterised by a dramatic drop in publications and patents, by significant cuts in scientific staff, and by a 23-month period during which NRC management was aware that the organization was contaminating the water table in a small Ontario community but did not inform that community's inhabitants. John McDougall's departure – signalled by a sudden, three-line email to employees in March 2016 announced that he was going on personal leave. During this time Maria Aubrey, Vice President of NRC, filled the role as Acting President. Effective August 24, 2016, Iain Stewart became the new President of the NRC. The details regarding McDougall's personal leave were not publicly disclosed. NRC is a Government of Canada organization. Its mandate is set out in the National Research Council Act. Publishing and selling or otherwise distributing such scientific and technical information as the Council deems necessary. A fire house at the Institute for Research in Construction, used to provide information to aid building code and fire code development in Canada. 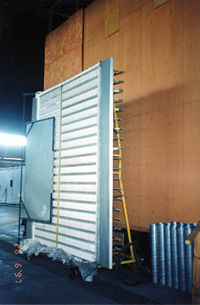 A radiant heat panel for precision testing of quantified energy exposures at the Institute for Research in Construction of the NRC, near Ottawa. The goal of the Algal Carbon Conversion Pilot Program  was to develop of an algae system to recycle carbon emissions from the oil sands. It contained plans for a $19 million facility to be constructed in Alberta, in partnership between the NRC [[Canadian Natural Resources Limited]| Canadian Natural]] and Pond Biofuels. In 2008 researchers from five I-CAN organizations were developing a Carbon Algae Recycling System (CARS) to "feed waste heat and flue gas containing CO2 from industrial exhaust stacks to micro-algae growing in artificial ponds". The "Algal Carbon Conversion", is related to prior interests of Mr. McDougall, as he previously headed Innoventures, a company involved in lobbying for the development of an algae system to recycle carbon emissions. The Algal Carbon Conversion Pilot Project, with plans for a $19 million facility to be constructed in Alberta, is a partnership between the NRC and industry partners, Canadian Natural Resources Limited (Canadian Natural) and Pond Biofuels. The NRC was not involved in this area of research prior to the arrival of Mr. McDougall. The Canadian Wheat Improvement Program is a "strategic collaboration with Agriculture and Agri-Food Canada (AAFC), the University of Saskatchewan’s Crop Development Centre and the province of Saskatchewan". With a budget of approximately $97 million (2013–2018), the Canadian Wheat Alliance will be conducting research on improving the yield of Canadian wheat crops and on the most efficient use of chemical fertilizers. Working with breeders and scientists at the Crop Development Centre and at AAFC, they will be integrating long term research with genetic improvement of wheat. The GaN Electronics program supports partner research and development activities with a goal of ensuring that GaN technology will create wealth and a greener future for Canadians. NRC is the only Canadian foundry for GaN electronics, and offers both normally-on and normally-off devices. The GaN500v2 Foundry Design Kit was released on June 28, 2014. The National Research Council of Canada Industrial Research Assistance Program (NRC-IRAP) was introduced in the 1950s to support product developments in small to medium-sized businesses. The NRC provides grants and financial support to business' looking to bring new and innovative technologies to the market. Some of the many innovations by NRC personnel included the artificial pacemaker, development of canola (rapeseed) in the 1940s, the Crash Position Indicator in the 1950s, and the Cesium Beam atomic clock in the 1960s. Since 1974 Paul Barton of PSB Speakers used the NRC's world-class measurement facilities, their anechoic chamber. By the 1980s more companies began to use this incredible resource and began to develop at the NRC. Even small companies had access to these facilities for loudspeaker measurements of high quality, offering them a competitive edge. Eventually almost every major Canadian company including Energy Loudspeakers and Paradigm Electronics, tested their loudspeakers at the NRC. Electrical engineer, Floyd E. Toole, who worked at the NRC was at the centre of this research. By the year 2000 most companies had their own sound chambers, but Paul Barton continued to use the NRC's facilities. In about 1990, PSB and other Canadian companies worked with the NRC on Athena to evaluate digital signal processing (DSP) for loudspeaker design. The metal walls of the NRC’s anechoic chamber are located about a foot and a half from the internal walls that surround it. The whole chamber is suspended on springs. This makes it a building within the M-37 building. The purpose of all this is to provide a completely isolated environment that, according to Barton, registers a noise level that is less than 0dB. (0dB is a statistical average of the lowest level of human hearing.) Wedges made from fiberglass are inside the chamber, and they help create the reflection-free environment. No sound gets in, none gets out, and what occurs within gets completely absorbed with nary a bounce. From 2002 to 2006, John R. McDougall, who was appointed President of NRC in 2010, was a member of the NRC-Industrial Research Assistance Program (NRC-IRAP) Advisory Board. In 2011 Bev Oda Minister of International Cooperation and Gary Goodyear, Minister of State (Science and Technology) announced the grant recipients. These included small to medium-sized businesses, such as, Nortek Solutions a privately owned Canadian software company. They received a $30,000 grant from NRC to hire a young graphics design graduate to work on their "CUROS" people management software. Oasys Healthcare, a company that provides "innovative audio and video solutions for the medical marketplace" received a $13,000 NRC grant for its new technology for operation rooms. Jeffrey Ross Jewellery's product called Dimples, imprints fingerprints in silver using an innovative process and material, developed through a NRC $35,750 grant. Close to 4,000 people across Canada are employed by the NRC. In addition, NRC also employs guest workers from universities, companies, and public and private-sector organisations. The NRC was established in 1916 under the pressure of World War I to advise the government on matters of science and industrial research. In 1932, laboratories were built on Sussex Drive in Ottawa. With the impetus of World War II, the NRC grew rapidly and for all practical purposes became a military science and weapons research organization. It undertook a number of important projects, which included participation with the United States and United Kingdom in the development of chemical and germ warfare agents, the explosive RDX, the proximity fuse, radar, and submarine detection techniques. A special branch known as the Examination Unit was involved with cryptology and the interception of enemy radio communications. According to the Canadian Security Intelligence Service website, the NRC headquarters in Ottawa "was a prime espionage target" during the Cold War. The NRC was also engaged in atomic fission research at the Montreal Laboratory, then the Chalk River Laboratories in Ontario. Post-WWII, the NRC reverted to its pre-war civilian role and a number of wartime activities were spun off to newly formed organizations. Military research continued under a new organization, the Defence Research Board, while inventions with commercial potential were transferred to the newly formed Canadian Patents and Development Limited. Atomic research went to the newly created Atomic Energy of Canada Limited. Foreign signals intelligence gathering officially remained with the agency when, by Order in Council, the Examination Unit became the Communications Branch of the NRC in 1946. The CBNRC was transferred to the Department of National Defence in 1975, and renamed the Communications Security Establishment. During the 1950s, the medical research funding activities of the NRC were handed over to the newly formed Medical Research Council of Canada. Finally, on May 1, 1978, with the rapid post-war growth of Canadian universities the NRC's role in university research funding in the natural sciences was passed to the Natural Sciences and Engineering Research Council of Canada. Under financial pressure in the 1980s, the federal government produced what popularly became known as the Neilson Report, which recommended across-the-board financial cuts to all federal government organizations, including the NRC. This led to staff and program cutbacks. In 2000, there were about 1000 NRC researchers with Ph.D.s conducting research in many areas. Recovery was slow, but the NRC has managed to regain its status as Canada's single most important scientific and engineering research institution among many other Canadian government scientific research organizations. As President of the National Research Council Canada, chemist Arthur Carty revitalised the organisation. In 2004 he left the NRC when then prime minister Paul Martin appointed him as independent, non-partisan advisor on science and technology. Around June 2014, the NRC was reportedly penetrated by Chinese state-sponsored hackers. Under the tenure of Prime Minister Stephen Harper, Canadian Government research organizations began to restrict the ability of government scientists to communicate with the public. This includes restricting scientists within the NRC to communicate with the public through non-scientist communications personnel. Harper's focus as an economist was on his action plan: creating jobs and building the economy. There were widespread concerns that the progress in development was at the cost of the environment. In 2012, the federal government moved "to defund government research centers in the High Arctic." In the same year National Research Council environmental scientists "were barred from discussing their work on snowfall with the media. "Scientists for the governmental agency Environment Canada, under threat of losing their jobs, were banned from discussing their research without political approval. Mentions of federal climate change research in the Canadian press have dropped 80 percent. The union that represents federal scientists and other professionals has, for the first time in its history, abandoned neutrality to campaign against Mr. Harper. The appointment of John McDougall, who promoted the partnering of science and technology research and development with industry partners, as President of NRC was followed by several controversies. During his tenure as President, there was a steep drop in research publications and new patents from NRC as scientific staff was cut significantly. An article published in April 2016 and based on information from the office of the Science Minister gave the following figures for the period 2011-2015: "In the five years from 2011 through 2015, the number of studies in academic journals were 1,889, 1,650, 1,204, 1,017 and 549, respectively. (Figures from 2010 and earlier are generally in the 1,200 to 1,300 range.) The number of patents over the period 2011 to 2014 (with no figure available for 2015) are: 205, 251, 128 and 112, respectively. The years before 2011 averaged 250 to 300 patents per year". Thus, the decline in the number of academic journal papers by NRC authors over the period 2011-2015 was 71%, and the decline in the number of new patents with NRC inventors over the period 2011-2014 was 45%. In September 2016, the office of the Science Minister released figures showing that from 2010 to 2015, the number of research officers at NRC fell by 26 percent, and the number of scientists and engineers of all kinds fell by 22 percent. “The job losses generally parallel the presidency of John McDougall”. John McDougall's tenure as President included the period during which the NRC contaminated the water table in the Eastern Ontario community of Mississippi Mills without informing its inhabitants. In January 2014, NRC employees at the fire-safety testing facility in Mississippi Mills were told to start drinking bottled water. (citation needed) 23 months later (December 2015), residents of Mississippi Mills with homes near the facility were warned by NRC that their well-water was contaminated with toxic chemicals called perfluorinated alkyl substances, often found in firefighting foam. In July 2016, Acting President Maria Aubrey formally acknowledged that the NRC's National Fire Laboratory was the source of the groundwater contamination in Mississippi Mills. In December 2016, it was reported that owners of homes near the lab in Mississippi Mills were launching a multi-million dollar lawsuit against NRC over water contamination. In March 2016, John McDougall sent a three-sentence email to NRC employees, announcing that he was going on personal leave. Subsequently, NRC management announced that two major projects he had led would be abandoned: re-branding the NRC as "CNRCSolutions" – though colourful "CNRCSolutions" T-shirts and "branding books" had already been distributed  – and re-organizing its three research divisions into five research divisions. Effective August 24, 2016, Iain Stewart became the new President of the NRC. The details regarding McDougall's personal leave were not publicly disclosed. Bill C-38 angered many people who opposed unregulated industrial growth. They argued that science was being gutted and silenced to open the way for development in ecologically sensitive areas in the north. That, in the opinion of the House, Canadian scientific and social science expertise is of great value and, therefore, the House calls on the Government to end its muzzling of scientists; to reverse the cuts to research programs at Environment Canada, Fisheries and Oceans Canada, Library and Archives Canada, National Research Council Canada, Statistics Canada, and the Natural Sciences and Engineering Research Council of Canada; and to cancel the closures of the National Council of Welfare and the First Nations Statistical Institute. ^ "Goodyear, the minister of state for science and technology, has presided over the most retrograde federal Science and Technology policy in memory. During his tenure, the government shuttered the office of the National Science Adviser, blocked asbestos from a UN hazardous chemicals list on which it clearly belongs, gutted the Fisheries Act, gutted the Navigable Waters Protection Act, set out to weaken the Species at Risk Act, killed the long-form census, eroded Environment Canada’s ability to monitor climate change, earned an international reputation for muzzling scientists and, at a great potential cost, defunded the world’s leading freshwater research centre... At the same time, changes to our science-funding regime and a makeover of the National Research Council, Canada’s science agency, into a tool box for industry have dented our basic-research infrastructure and damaged our prospects for innovation (Himelfarb 2014)." ^ a b c d Government of Canada nd. ^ Canada, Government of Canada. National Research Council. "Research programs and collaboration opportunities - National Research Council Canada". www.nrc-cnrc.gc.ca. Retrieved 5 April 2018. ^ "Science minister responds after NRC shakeup, but with few details". Ottawa Citizen. 2016-04-09. Retrieved 2018-11-23. ^ "NRC's five-year brain drain dealt 'a serious whack' to research". Ottawa Citizen. 2016-09-22. Retrieved 2018-11-23. ^ a b "National Research Council president on leave, no reason given". ottawacitizen.com. 4 April 2016. Retrieved 5 April 2018. ^ a b Canada, Government of Canada. National Research Council. "Iain Stewart - National Research Council Canada". www.nrc-cnrc.gc.ca. Retrieved 5 April 2018. ^ Hoag 2011, p. 269. ^ a b c d NRC 2013c. ^ I-CAN 2008, p. 11. ^ a b National Research Council Canada 2013. ^ a b c d Schneider 2000. ^ "The National Research Council headquarters in Ottawa". Canadian Security Intelligence Service. Archived from the original on 2007-06-09. Retrieved 2009-06-18. ^ a b Nature 2008, p. 866. ^ Stephen Marche (14 August 2015). "The Closing of the Canadian Mind". New York Times. Sunday Review. Toronto. Retrieved 14 August 2015. ^ "Science minister responds after NRC shakeup, but with few details". ottawacitizen.com. 9 April 2016. Retrieved 5 April 2018. ^ "NRC's five-year brain drain dealt 'a serious whack' to research". ottawacitizen.com. 22 September 2016. Retrieved 5 April 2018. ^ "Toxic chemicals used in fire-fighting foam discovered in water in 2013 - CBC News". cbc.ca. Retrieved 5 April 2018. ^ "NRC admits it's the source of Mississippi Mills water contamination". ottawacitizen.com. 8 July 2016. Retrieved 5 April 2018. ^ "Mississippi Mills residents sue NRC for $40M over water contamination". ottawacitizen.com. 6 December 2016. Retrieved 5 April 2018. ^ "NRC 'solutions' rebranding quietly dropped without explanation". ottawacitizen.com. 6 April 2016. Retrieved 5 April 2018. ^ "NRC president McDougall officially departs — but reasons are still secret". ottawacitizen.com. 29 July 2016. Retrieved 5 April 2018. ^ Canada, Government of Canada. National Research Council. "Advanced electronics, photonics and digital technologies - National Research Council Canada". www.nrc-cnrc.gc.ca. Archived from the original on 2018-04-06. Retrieved 5 April 2018. ^ Canada, Government of Canada. National Research Council. "Measurement science and standards - National Research Council Canada". www.nrc-cnrc.gc.ca. Retrieved 5 April 2018. ^ Canada, Government of Canada. National Research Council. "Astronomy and astrophysics - National Research Council Canada". www.nrc-cnrc.gc.ca. Retrieved 5 April 2018. ^ Canada, Government of Canada. National Research Council. "Security and disruptive technologies - National Research Council Canada". www.nrc-cnrc.gc.ca. Retrieved 5 April 2018. ^ "Canadian Civil Aircraft Register: Quick Search Result for Government Of Canada, National Research Council". Transport Canada. Retrieved 2018-10-16. "Metadata | Collection". National Film Board of Canada. Retrieved 12 January 2010. "Open for business: Refocused NRC will benefit Canadian industries: The Government of Canada launches refocused National Research Council". NRC (Press release). Ottawa, Ontario: National Research Council. 7 May 2013. Archived from the original on 2014-01-11. Retrieved 11 January 2014. "Retired NRC Scientists Burtnyk and Wein honoured as Fathers of Computer Animation Technology in Canada". Sphere. 4. 1996. Retrieved 11 January 2014. Wikimedia Commons has media related to National Research Council of Canada.